BOOM! Studios and PAWS Inc are proud to announce GARFIELD: HOMECOMING #1, a new four-issue limited series debuting in June 2018. 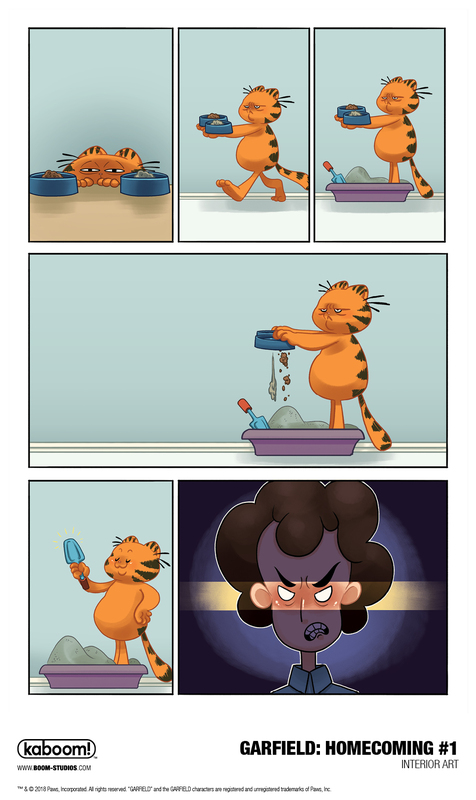 Feeling mistreated and unappreciated by Jon, Garfield embarks on a journey for a new home and, along the way, meets up with a clown who works in an old-timey travelling circus. Convinced that this is the place for him, Garfield becomes part of the act. Wait. What is that cannon for? Writer Scott Nickel (Garfield: His 9 Lives) will pair with a different artist in each issue of GARFIELD: HOMECOMING, as Sara Talmadge (Steven Universe) takes us through this wild ride in the first chapter of Garfield’s journey outside of the friendly confines of Jon’s house. 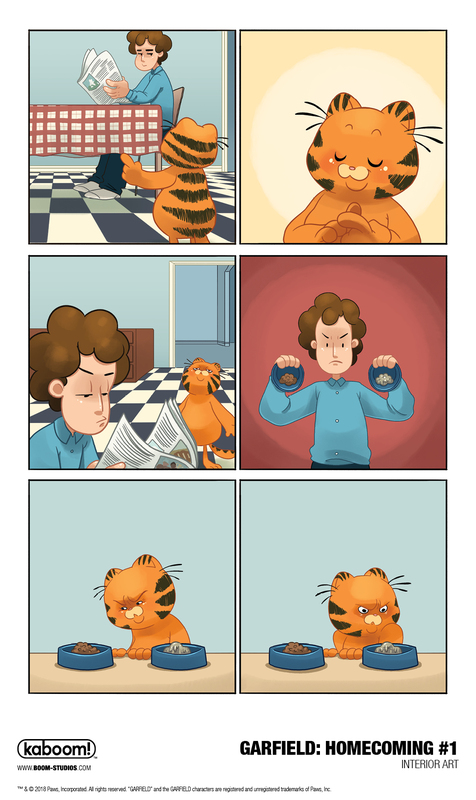 GARFIELD: HOMECOMING #1 features a main cover by Andy Hirsch (Adventure Time) with Sara Talmadge. 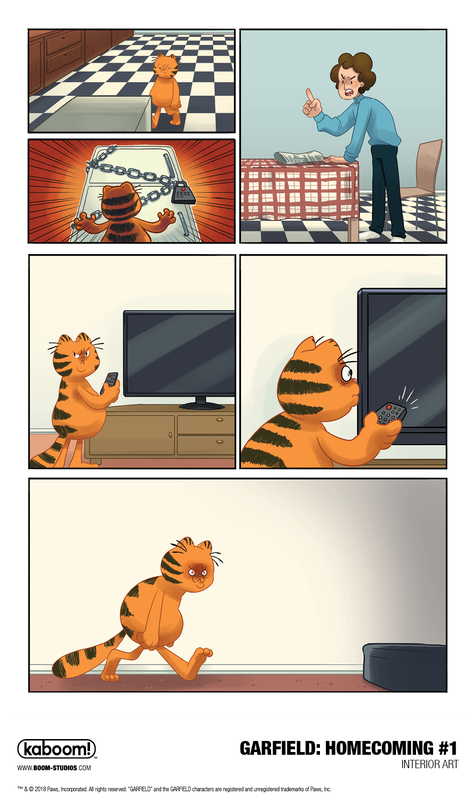 GARFIELD: HOMECOMING is the latest release from BOOM! Studios’ critically acclaimed KaBOOM! imprint, publisher of world-class licensed series such asAdventure Time, Steven Universe, Over the Garden Wall, Peanuts, and Rugratsalong with original series like Brave Chef Brianna by Sam Sykes and Selina Espiritu and The Deep by Tom Taylor and James Brouwer. 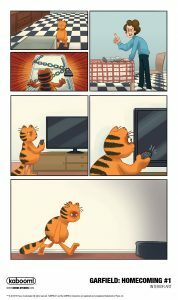 Print copies of GARFIELD: HOMECOMING #1 will be available for sale in June 2018 at local comic book shops (use comicshoplocator.com to find the nearest one) or at the BOOM! Studios webstore. Digital copies can be purchased from content providers, including comiXology, iBooks, Google Play, and the BOOM! Studios app.